A lightweight carbon-fiber car that runs on lithium-ion batteries and a portable wind turbine has just traveled 3,000 miles across Australia—and it used only $15 worth of electricity. The car, dubbed the Wind Explorer, was designed by New Jersey-based Evonik Industries to demonstrate the potential of the company’s developments in battery power and lightweight materials. 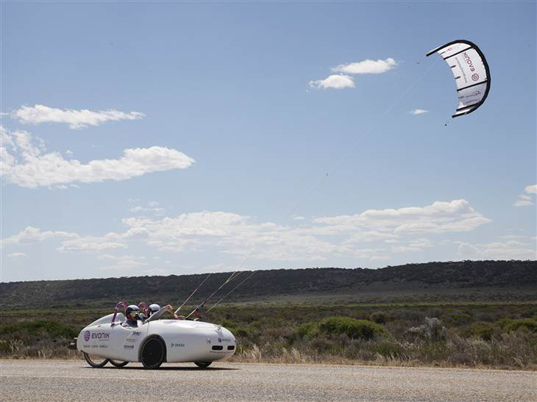 The car used three power sources: a portable wind turbine, lithium-ion batteries and a giant kite that pulled the car when the wind was favorable. Producing enough energy to travel 175 to 225 miles a day, the lithium-ion batteries were recharged at night for the most part of the journey. “They were able to supplement their lithium-ion battery power with kite power about 10 to 15 percent of the time,” Bill Bunting, a senior scientist with Evonik Industries. “Occasionally, they plugged into the Australian power grid and that’s where the dollar figure of less than $15 worth of electricity comes from to travel all the way across Australia,” Bunting said. The car’s carbon-fiber body weights 200 pounds, batteries add another 200 and the portable turbine about 70 more. With two average-sized people required to operate the vehicle and fly the kite, the Wind Explorer weights around 1,000 pounds. It addition to carbon fiber, the company uses “special chemical materials that go into the rubber tires … that basically allows the tires to roll along with the least amount of energy while still having the most amount of traction and durability,” Bunting said. Interesting but possible Darwin Award in this country when the Semi catches the kite and pulls your trike under the axles. Here is a better alternative: http://www.dailymail.co.uk/sciencetech/article-2767806/Meet-Stella-solar-powered-car-drives-500-miles-SINGLE-charge-warns-traffic-lights-change.html You never need to fuel this vehicle conventionally....unless you drive a lot at night. While I agree with your characterization, the article specifically says that they carried the portable turbine with them in the car. I find this kind of thing interesting, but not particularly *useful*. I would, however, like to know more about their tire additives. Grid power was the third source of energy. Batteries are a storage medium, not a source. I can't bring myself to think of this as a wind powered vehicle, it is an electric vehicle. It had a wind powered generator, which may or may not have been carried on-board (I doubt it), it had a kite for boost(15% real wind power), but you could have just as easily plugged the thing in every night and called it a coal burning car by this standard.